If you live in certain cities, like New York City, and have a little one in the home, having a window guard installed is the law. In other parts of the country it is just safe sense. That’s because window falls across the nation account for nearly 3,300 trips to the ER for kids age 0 – 4 EACH YEAR according to a recent study in the journal Pediatrics. Crazy right? You might think, well I live in a 1 story home... no worries. Think again. Over 30% of injuries from falls occurred out a 1st story window. Well the good news is those accidental falls are preventable by installing a window guard. Some communities with mandatory window guard regulations have seen up-to a 96% reduction in falls!!! Holy moly folks! So have I convinced you that installing a window guard is a big win for your family? Window guards are similar to top of stairs baby gates. They are expandable to perfectly fit your window opening, they are hardware mounted to support the weight of your child and they are incredibly confusing to purchase... until you read this guide, obviously. 1) PREWORK: Before you purchase make sure you understand what the relevant codes are in your area to make sure you are compliant. You can contact your local fire department or building code department. They can recommend specific brands and products. Some cities like New York City, Boston, and states like New Jersey have community programs and some even offer access to free window guards – check them out! Learn about general window safety tips with this post. 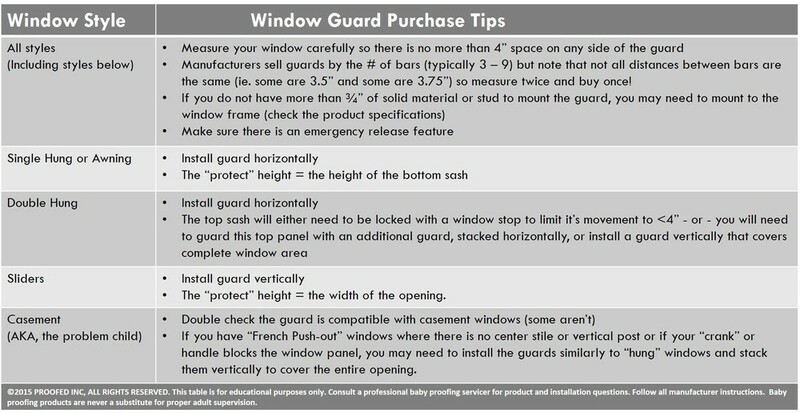 3) PRE-INSTALL: Before you install, double check to make sure you have a guard that is the correct width and height for your window frame and doesn't create a > 4 inch gap on any side. Example: On a hung window, measure the space from the top guard bar to the bottom of the window sash and also check the space from the bottom of the guard to the bottom of the window frame. Look at using two guards stacked on top one another to provide the appropriate coverage. Return your current guard for one that covers a larger opening. You may simply need a taller guard. a. You will need a screwdriver or power drill to complete the installation so double check drill bit requirements in the installation manual. b. Mount screws into a stud or solid frame for safest install. c. Some posts can be mounted in the inside or outside of your window frame, again, follow manufacturer suggested placement as some companies suggest the inside window track. One-way screws may be required. d. Some city codes require “one-way” or “tamper resistant” screws be used. If the manufacturer did not supply these, you can pick them up at the hardware store (they only cost about $0.25 - $0.40 each). e. Double check that the post does not allow a 4” gap opening on the bottom or top of the guard. f. You may want to use a ruler and level to ensure correct alignment across the window frame. As with most things in an old home, older windows may not be plumb. The most important thing is that you do not create any space larger than 4”. a. Take a few moments to learn how to use the emergency release feature. Many products have quick release buttons that require two fingers and some dexterity or a safety release pin. Practice a few times until you get the hang of it. b. Teach any older children and any other adult in the home how to remove the guard in case of an emergency. c. Review and practice removing the guard on a regular basis. Some manufacturers suggest every time you change your smoke detector batteries or every six months. d. This is also a wonderful time to talk to your children about a family emergency plan in case of fire, earthquake or other need to quickly evacuate the home along with general window safety. OK, at this point you should have some perfectly installed window guards in your home! Congrats and remember your adult supervision is always the most important safety measure. If this post was helpful, please "like" the heart below and make sure to sign-up for the newsletter for even more helpful tips to tackle everything childproofing!